Background Research on the mortality of released prisoners is sparse and what research has been conducted has mainly focused on drug-related causes of death. We undertook a systematic review to investigate the risk of suicide in recently released prisoners. Methods We obtained data from MEDLINE, EMBASE, PsycINFO, Web of Science and the Cochrane central register of controlled trials (CENTRAL). The outcome measure was the relative risk of suicide in released prisoners. Findings We identified nine studies that were included in the review, of which five provided enough data to undertake a meta-analysis. All studies showed increased levels of mortality from suicide in released prisoners. The meta-analysis showed the risk of suicide in released prisoners was 6.76 times that of the general population (RR 6.76, 95 per cent CI 6.08 to 7.52). 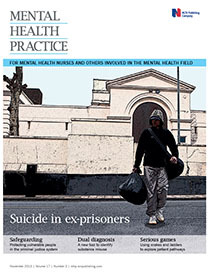 Interpretation Prisoners are at a higher risk of suicide after release. The increased risk is likely to be linked to high levels of mental illness documented in prisoners, combined with the stress of the transition from prison to the community. Prison authorities must work closely with probation, social and healthcare services in the community to provide a complete service to this high-risk group. Randomised controlled trials should be funded to gain an evidence base on which to develop effective and cost-effective interventions.